Entrance into the gallery’s show! One of the greatest parts about art is that it can take many shapes and forms. At Sharon Arts Gallery located in downtown Peterborough, their current exhibit showcases one of those unique ways: mail art. From canvases, collages, stamps and more, mail art becomes mail art by simply being sent in the mail. 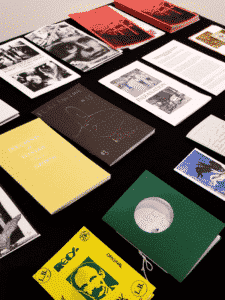 Whether you create something on the mailer, stick a postcard with your work on it into the mailbox, make a zine or visual poetry, your creation becomes this specific type of art just by going into the mail. 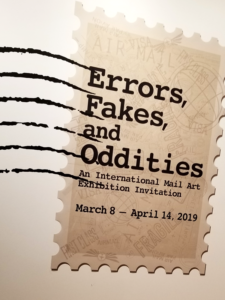 Artist Chuck Welch and the Sharon Arts Gallery have curated their space utilizing mail art sent in from around the globe, and it’s worth a stop to see. It’s incredible that something this big is mail art! A little history to start. Mail art has been around since the 1950s, originally due to artists using the postal service to send art to each other. Creating such a network became a very vital part of the mail art movement, and it grew throughout the last several decades. 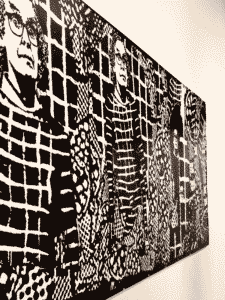 Thanks to Chuck Welch’s influence, it continues to grow which we get to see within the Sharon Arts Gallery’s exhibit. 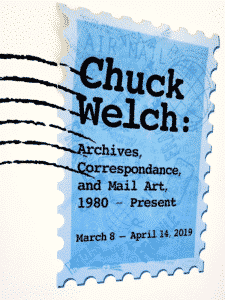 Coming into the gallery through the entrance on Grove Street in Peterborough takes you through an archive of Chuck Welch’s collected pieces over the decades, giving you a chance to look at the history of mail art along with the changing influences throughout the years. From walls collaged with various artists’ work to rows of individual pieces, the gallery shows an evolution of mail art on walls. Some pieces are so small, while others are large and span a good portion of gallery space. Given that this gallery covers over 30 years of mail art, you can see cultural influences along with the changes in styles as well as technology within. The second half of the gallery is dedicated to mailed in submissions. The lower half of the gallery then takes you into the more recent art collected. This section of the gallery is dedicated to the call for art that was put out by Chuck Welch and NHIA, and showcases several hundred pieces of mail art carefully arranged into more collages. Tables with zines and other 3-dimensional art are situated about the gallery as well, showing just how mail art can be interpreted so differently. It’s in this part of the gallery that popular culture, styles and influences are the most evident, with the artists involved ranging from school students to creators from around the globe. Visitors are encouraged to mail art to artists they see in the gallery, continuing the tradition of this very unique genre of art. Believe me, just seeing all of these unique pieces will inspire you to make some yourself and package it up to send! Arts Gallery will be exhibiting both galleries of work until April 14th, which gives you more than enough time to experience. To see some pieces mailed in, check out their website where they catalogued received pieces over here. 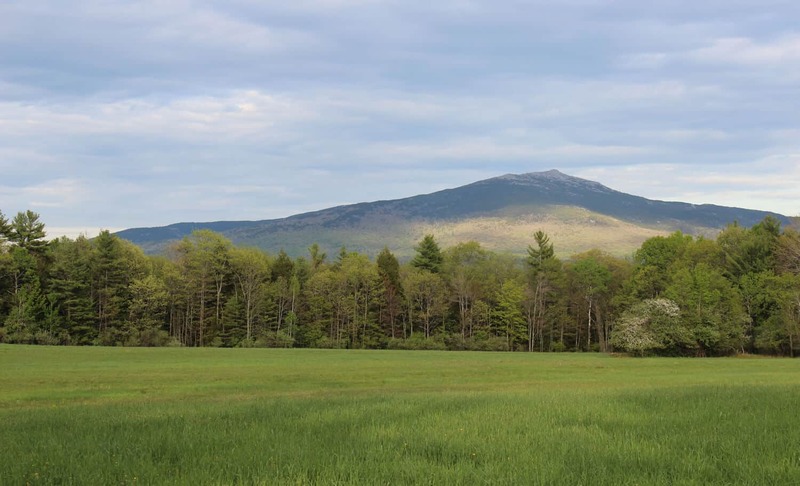 This entry was posted in Art, New England, Peterborough and tagged gallery, mail art, monandock region, New England, New Hampshire, peterborough new hampshire by admin. Bookmark the permalink.